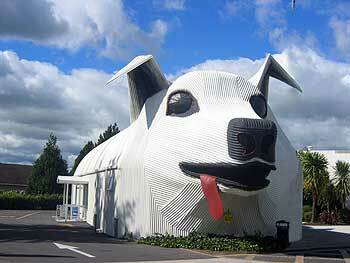 A giant dog posing as an information centre in Tirau. So, we were heading for Matamata. Never heard of it? Perhaps you'd know it better as 'The Shire' or Hobbiton. Matamata is one of the locations where Lord of the Rings was shot, home to the filthy stupid hobbitses. Actually, it's just about the only location that is recognisable from the film. While most of the sets (as opposed to computer generated or stage sets) were dismantled after filming, agreed as part of the contracts, Matamata was lucky enough to keep a little part of Hobbiton. 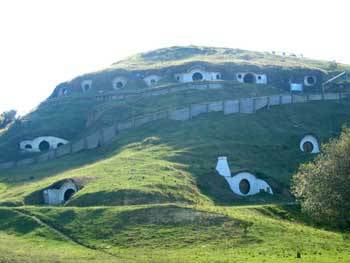 New Line Cinema had intended to dismantle the entire set, and had begun the process, removing about ten hobbit holes, the fake bridge and the village buildings when rain set in and stopped progress for seven days, and then they weren't due to return for another six months. During that time the owners of the farm where it was filmed managed to get permission to keep the sets and to run tours - it really is just a stroke of luck that anything is left at all! The information centre (where we bought the tickets) mentioned that the sets are not as they were in the film. This had me worrying that there would be little left, but I was pleasantly surprised. Comparing a hobbit hole in the film to what we saw in front of us revealed that all the flowers were long dead and gone, the wooden facias had been stripped away and the round doorways were now just round holes leading to ... well, nothing really. 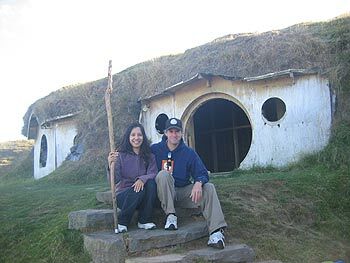 All the interior shots of Bag End (where Bilbo and Frodo lived) were done in a studio, and so the hobbit homes were little more than fake frontages. Close-up, you could see that the homes were little more than white-painted plywood over scaffolding nested into the hills, but from a distance this was The Shire. We were there! All that was missing was a bunch of 3-foot nothing people with big feet and even bigger ideas. In this farm, the film-makers decided to place all the hobbit holes, but also the village buildings, the vegetable patches and they also filmed a number of other location shots that they never intended to. A couple of anecdotes picked up that you won''t have heard from any of the LOTR DVD extras. Firstly, when the location scouts spotted this farm, they knocked on the door of the Alexanders (who own the farm) and said that they'd be interested in using the farm to shoot a film. Mr Alexander replied: "OK, but can you call back later 'cos I'm watching the rugby at the moment." Thankfully for Mr Alexander, they did just that. Secondly, the one feature that clinched that particular farm as the location was the tree by the lake, known as 'The Party Tree', a perfectly symetrical tree by which the villagers held Bilbo's birthday celebrations. But that very tree nearly got cut down by the Alexanders 5 or 6 years previously. Mr Alexander thought it was ugly, but now they refer to it as 'The Money Tree'. Not cutting that tree down was the best decision he ever made, I'd wager! Ian and Manda in front of Bag End, home of Bilbo and Frodo. The tour lasted two hours from pick-up in the centre of Matamata to drop-off, and it was just about the right amount of time. We got to hear about the filming process, how the set was built, how secrecy was such a big thing (when the army arrived with heavy earth-moving equipment to build a road to the set, Mr Alexander had to tell inquisitive neighbours that they were just carrying out an exercise, no mention of the film was allowed because of the contracts he signed) and walked all round the set, taking as many photos as we wanted. For Lord of the Rings fans, this is the absolute must-see in New Zealand. One final thing, just when you think your Lord of the Rings experience is finished, think again. As we came back in to town, we took a walk along the main street and discovered that the town has completely embraced its hobbit connections - every other shop seemed to have a hobbit hole painted on the window, and even normally straight-laced business were joining in (like Lloyds Bank and ANZ Bank, which proudly badged itself as ANZ Hobbiton). All very surreal. We left Matamata for Rotorua. At 5pm, it was too late to do or see much in Rotorua - an area renowned for thermal pools and volcanic vents - so we simply found somewhere to eat (and, later, somewhere to stay), leaving tomorrow free to do all of that. We had dinner in a Mexican Cantina. While we tried to finish off the big stack of nachos and chilli, I noticed a really bad smell. Manda noticed it too, and thought that the young workers there had burned something, but it still wasn't the right smell for overdone taco/nachos. Then I twigged - this was a volcanic area, and what we were smelling was sulphur. How it took 20 minutes for that smell to register I don't know (unless the wind had been blowing it in another direction). For the rest of the evening I couldn't help notice the smell, never getting acclimatised to it. I'd even wake up in the middle of the night, smell the air and think, "That's rancid!" then drop off once more ... only to repeat it an hour or so later.